Explanation: What's large and blue and can wrap itself around an entire galaxy? A gravitational lens mirage. Pictured above on the left, the gravity of a normal white galaxy has gravitationally distorted the light from a much more distant blue galaxy. More normally, such light bending results in two discernable images of the distant galaxy, but here the lens alignment is so precise that the background galaxy is distorted into a nearly complete ring. Since such a lensing effect was generally predicted in some detail by Albert Einstein over 70 years ago, such rings like SDSSJ1430 are now know as Einstein Rings. SDSSJ1430 was discovered during the Sloan Lens Advanced Camera for Surveys (SLACS) campaign, an observation program that inspected lens candidates found by the Sloan Digital Sky Survey (SDSS) with the Hubble Space Telescope's ACS. Strong gravitational lenses like SDSSJ1440 are more than oddities -- their multiple properties allow astronomers to determine the mass and dark matter content of the foreground galaxy lenses. Given these determinations, SLACS data has now been used, for example, to show that dark matter fraction increases with overall galaxy mass. 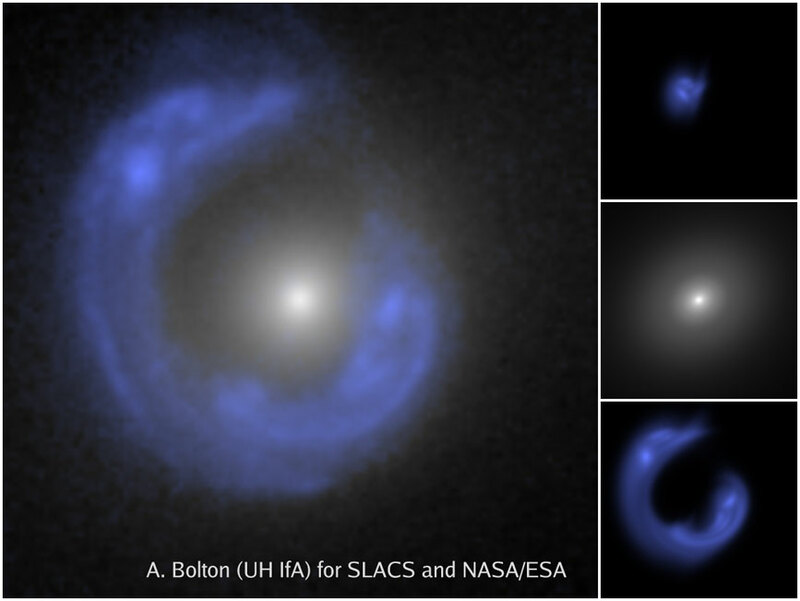 The inset images on the right depict, from top to bottom, a computer reconstructed image of what the background blue galaxy really looks like, just the white foreground galaxy, and just the lensed blue background galaxy.